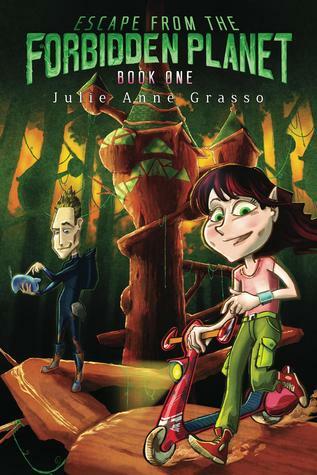 Today I have an interview with Julie Anne Grasso, author of the middle-grade book Escape From The Forbidden Planet. With a background in pediatric burns nursing, I spent many years literally wrapping children in cotton wool and every day I witnessed great courage and resilience from the tiny people I cared for, which inspired me to write stories about a little girl elf just like them. Add in some very funky technology, my love of science fiction and my desire to impart great values through my little girl elf named Caramel and there you have it, Escape From The Forbidden Planet was the result. From start to publication about three years, but in that time I have also written the sequel “Return To Cardamom” as well as an outline for book three, so stay tuned for the next installment. Quite a lot actually. I had a very specific look in mind for my little girl elf as well the rainforest world that she lives in, so I worked really closely with my illustrator who is also an animator. Within a few months we had a cover that I was totally in love with. Well, I of course love my main character Caramel, because although she discovers she has these incredible abilities, the injury that she sustained as a little elf undermines her confidence. Throughout the story we watch her slowly regain her confidence as she realises she must believe in herself and overcome her disability in order to rescue her family and friends from the clutches of the evil Alexander clones. I really wanted to depart from the latest trend where books with strong violence and horror themes are being targeted to Middle Grade readers. I wanted to impart a story about a little girl elf who displays courage, resilience and persistence in order to defeat her enemies minus the strong horror and violence. She has a degree in Nursing from Queensland University of Technology and has been published in her nerdy nursing specialty in medical journals, but her true love is writing about elf worlds that preferably involve some kind of dessert obsession. She has an awesome husband who loves to do battle in the computer trenches every day and a little 15 month old elf called Giselle. Caramel Cinnamon thought the worst day of her life was the day her grandparent’s the King and Queen of the Elves of Cardamom went missing. The day she spills sticky toffee syrup onto her father’s computer, that’s when her worst nightmare begins. Suddenly she finds herself marooned on a forbidden planet by an evil clone, with a very sticky secret. Caramel is desperate to find a way to escape and rescue her grandparents. If she doesn’t she will lose her dreams of returning to Cardamom to become a healer like her mum. Luckily, she has a secret of her own and the lives of her family and friends depend on it!